Fr. Irenaios (Skopelitis) was the patriarch of the Church of Jerusalem from 2001 to 2005. Patr. Irenaios was deposed by the Holy Synods of the Church of Jerusalem and the Brotherhood of the Holy Sepulchre for unauthorized sale of church property. Born Emmanouil Skopelitis in April 1939, Irenaios was elected primate of the Church of Jerusalem on August 13, 2001 in the Church of the Holy Sepulchre. 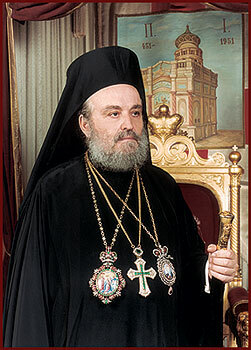 He was enthroned on September 15, 2001, as the 140th Patriarch of the Holy City of Jerusalem and All Palestine, Syria, beyond the Jordan River, Cana of Galilee and Holy Zion in the presence of senior church and secular dignitaries, including Archbishop Christodoulos of the Church of Greece and Metropolitan Nicholas of the Church of the Czech Lands and Slovakia. He was born on the Island of Samos in Greece and came to Jerusalem in 1953 and served for many years as exarch of the Holy Sepulchre in Athens. Only a few years into Irenaios's patriarchate, he became embroiled in bitter controversy. Several parcels of church-owned land in the Old City of Jerusalem were sold to Israeli developers. As most of the Orthodox Christians in the region are Palestinian, and the land was in a Arab-populated area that most Palestinians hoped would become as a part of a future Palestinian capital, this caused a great deal of outrage among Church members. On May 5, 2005, most of the Holy Synod of Jerusalem announced in a letter they had broken relations with Patr. Irenaios, and regarded him as dismissed as Patriarch of Jerusalem. The decision reached by the Holy Synod of the Brotherhood of the Holy Sepulchre was made final on May 6, 2005 by a two-thirds vote of that body. Irenaios thus officially ceased to be patriarch at that point. On May 24, 2005, a special Pan-Orthodox synod was convened in Constantinople to review the decisions of the Holy Synod of Jerusalem. The Pan-Orthodox Synod under the presidency of Ecumenical Patriarch Bartholomew I (Archontonis) of Constantinople voted overwhelmingly to confirm the decision of the Brotherhood of the Holy Sepulchre and to strike Irenaios's name from the diptychs, and on May 30, Jerusalem's Holy Synod chose Metropolitan Cornelius (Rodousakis) of Petra to serve as locum tenens pending the election of a replacement for Irenaios. On June 16, 2005, Irenaios was laicized by Jerusalem's Holy Synod, so he is now known simply as the monk Irenaios. On January 6, 2011, the Associated Press released an article claiming that Irenaios refused to recognize the deposition, considered himself the legitimate Patriarch, and that he has been under house arrest for years. Ousted patriarch behind locked doors in Jerusalem. Guardian.co.uk. AP foreign, Thursday January 6 2011. This page was last edited on August 23, 2017, at 21:20.